When I started this blog I did not intend to write about garden plants but hey, a morning in the garden in the beautiful sunshine made me change my mind. Two quite different plants did it for quite different reasons. The first is I think Symphytum grandiflorum (above and right), I am not absolutely sure, and is valuable for a number of reasons. It grows to about 25cm and is great ground cover for a sunny position even suppressing the dreaded Ground Elder (Aegopodium podagraria) which in my experience makes it unique. Equally of course that means it is invasive but in a very civilized way and can easily be pulled up in large patches as it is very shallow-rooted. It's greatest value is however for insects, it appears to produce plenty of nectar and/or pollen and is always covered with six-legged beasts especially bees. Even better, it starts flowering in February and thus provides an important food source for early emerging insect species and it is still going strong and will probably not finish flowering for another few weeks. 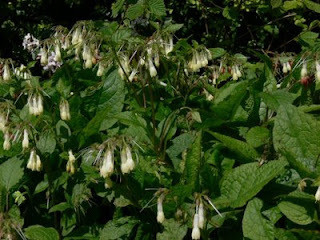 Some might dismiss it as just another Comfrey but although it is not an elegant plant I think it is a valuable addition to the garden. 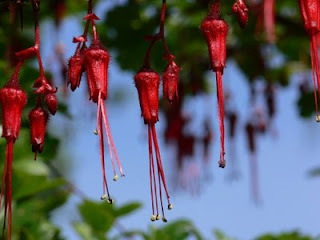 The second plant is for unashamedly decorative interest, Ribes speciosum, the Fuchsia-flowered Currant or Californian Currant. The first plant I ever saw of this was trained espalier-style, 5m up a south-facing wall to show off its flowers that hang down below the branches to full effect and it was quite spectacular. My own plant is more or less free-standing and is about 3m high. The flowers open virtually together and the contrast between the bright red flowers and the vibrant green of the newly- emerged leaves is something to behold. Individually, the flowers are not large (about 3cm inclusing the exserted stamens) but en masse they have quite an impact. 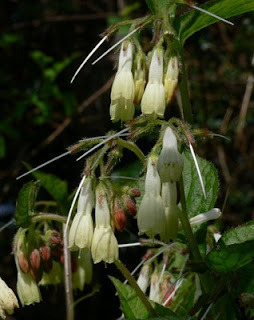 Apparently, it is only just hardy but has survived in my north-facing garden for years. It is difficult (for me impossible) to root from cuttings unlike most Ribes species and that may explain why I have not seen it too often either in gardens or for sale. The final merit of this plant is that in the summer it produces small red- bristled gooseberries, that until this moment I have never thought of tasting, I shall try this year. I think if I was restricted to having a single shrub in the garden it would be this.